You need to overlook your flaws, mistakes and regrets if you want to get ahead and move on towards the finish line. The easiest way to cross the ocean is to plan, consider situations, lay out options and above all start taking steps. Everyday gives us a new way to approach life. In order to achieve the dreams and goals that we have in our hearts we must be able to not only look forward, but also have the capacity to move forward as well. Waiting on God doesn't mean to stop everything and just wait. 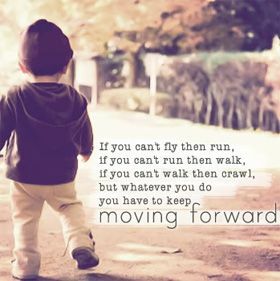 It means to keep striving and moving forward in faith knowing God is working. Life belongs to those who think little of yesterday and more of tomorrow. It takes a lot of courage and trust to look past what you've been through, and trust someone new not to put you through it again. I'm ready again hoping this time it will be forever.